Greece has been a somewhat unstable entity throughout its history and particularly with the coming into being of nation states in the 18th century. Its borders have shifted, expanded and contracted on several occasions over the last 200 years leaving behind a legacy of quite virulent Greek nationalism. Greek armies were also involved in foreign intervention against the Russian revolution in north west Asia minor. The Greek communist party was founded in 1918 and was first attacked by the state in 1921 for their policy of revolutionary defeatism in the war with Turkey. It was banned under the military dictatorship in 1927. The ban came out of the demand for Macedonian and Thracian independence. This issue dominated the KKE (Communist party) in the pre-war years although the demand for independence was dropped by the Central Committee in 1935. The treason trials of the leadership in 1925 were significant because it was in this period that the first graduates from the Communist college in Moscow arrived and filled the vacuum. The 3rd congress in 1927 saw a purge and the expulsions of two of the three factions as trotskyists. Typically of Stalinism the leader of the faction expelling the others was to be executed himself some eight years later as a trotskyist himself. During the third period the CP repeatedly exposed its members to repression by for instance calling general strikes which only 12,000 or so would support. At the time the KKE had about 1500 members. Mass demonstrations of as few as 150 people were called and as might be expected the failure was not blamed on the Moscow line but on the local leadership. This was followed by the popular front period which saw mass unrest up to 1936 when General Metaxas seized power with a regime modelled on the fascist states. The KKE disintegrated in this period helped along by a pardon for those who confessed and named others. Some 45,000, far more than the membership of the KKE did so. When Italy attacked Albania in 1939 the KKE said there was no longer any need to overthrow Metaxas as he was now an allies. Metaxas tried to play both sides however and in October 1940 there were anti-fascist demos in many cities. The British sailed into Greek waters and on the 28th Italy invaded. The party again pledged support to the Metaxas government. Metaxas responded by ordering the arrest of all known communists. This was at a time when the Stalinist parties were meant to be supporting the Hitler - Stalin pact so they claimed the KKE’s pledge of support was a forgery. The Greeks smashed the Italian invasion and advanced into Albania. Then Hitler sent troops and within 3 weeks defeated both Greece and the British forces there. The more Stalinist party members actually welcomed the Nazi troops. Metaxas had died and his regime collapsed. Only limited areas of Greece were occupied and it appears the rank and file soldiers had some sympathy for the Greeks most notable when an Italian firing squad refused to execute the leader of the Greek ‘left opposition’ who had been building anti-fascist cells. The resistance movement was split into the nationalist ELAS directed by the KKE controlled EAM which had between 10 and 40,000 fighters by 1943 and the EDES which was favoured by the allies because it was pro-monarchy Resistance was significant, for instance when Germany attempted to take workers to Germany in 1942 they were forced to back down in the face of a general strike. 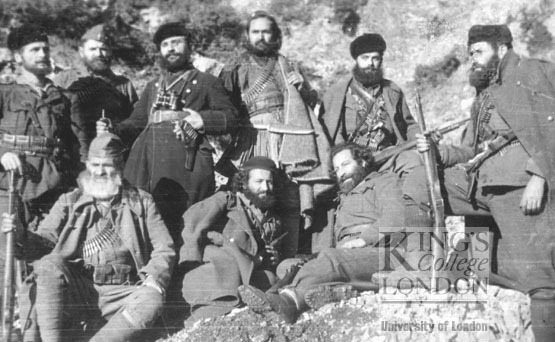 The armed resistance however was not directed heavily at the Axis, rather the KKE concentrated on training their army and refused to help the allies at times. In 1943 the KKE controlled ELAS forces launched an all out attack on the EDES. This stalled and German high command used the opportunity to mount a 3 month offensive which caused huge damage to both groups. Winter 1943-44 saw the worst of the occupation with mass starvation and the transport of 50,000 to Bulgaria as forced labourers. ELAS conducted internal purges and re-training. In the meantime the allies were preparing to retake control. In particular they were concerned by mutinies in exile Greek army units in Egypt in support of the CP being given a place in the exile government. The army came to be controlled by Stalinist directed soldiers committees. The British high command sent the British army in, disarmed the Greeks and placed them in POW camps in the Desert. Loyal troops were recruited out of these camps to form the loyalist Rimini regiment. At the same time they offered the CP a place and an agreement was reached for a post-war national government. In 1944 the Papandreou Government was transferred to Naples, their task was made easier on the surrender of Italy as they accepted the Italian division in Greece changing sides and so maintaining order. The ELAS accepted British control of liberation As the Germans left the British arrived, some 26,000 and 5 air squadrons. The ELAS had 50,000 and although it could have seized power did not do so on orders from Moscow. Instead it proceeded to settle scores not only with fascists but also with ex-members, trotskyists and archeomarxists. The archeo-Marxists were an intellectual tendency around since 1921 dedicated to translating Marx into Greek, in the third period (29-33) they were the prominent force in many of the unions. From 1934 on they split and became irrelevant. Many of their members who survived the war were executed by the Stalinists. probably around 100 were executed in all. The Greek trotskyists as elsewhere and split into three factions, defenceists who supported but did not (could not) participate in the resistance. Defeatists who saw the occupation as irrelevant and sought to fraternise with German and Italian troops on an anti-capitalist basis. and centrists who adopted an ‘intermediate position’. At time these were in one, two or even three organisations. In 1944-45 the Stalinists executed several dozen trotskyists regardless of which of these factions they had belonged to. In 1944 and 1945 it is estimated that the Stalinists executed hundreds of their own members, including well known names in the resistance, as well as the archeo-marxists and trotskyists. Greece before the war was a country ripe for social change with a small percentage holding most of the land and industry, major industries being foreign owned and a debt 150% of the annual national revenue. The allies released this and their major purpose after German withdrawal was to prevent any social revolution. Luckily they had Stalin on their side, at Yalta it had been agreed that Greece would be in the British sphere of influence. The British forces re-activated the various forms of local authority set up by the Nazis with local fascist support. At the same time Papandreou forbade the ELAS from entering Athens and on 30th October declared EAM disbanded. All arms were ordered to be surrendered by December 10th. Within days Athens saw a mass demonstration against the governments re-imposition of the old order and on 3rd November it was reported that 2000 textile workers had taken over their factory and appointed a management committee. It is difficult to access the extent of this movement now as everybody including the KKE deny it. Churchill cabled the general in charge to act as if «he were in a conquered city, confronted by local rebellion». More troops were flown in from the Italian front and on 3rd December British troops fired on an EAM demonstration killing 23 and wounding 150. Martial law was declared and British troops disarmed 3 ELAS units. EAM called a general strike and ELAS seized 21 of the 28 Athens police stations. On the 5th hundreds of thousands turned out for the funerals with banners reading ‘British soldiers; let us choose our own government». But the party leadership just asked the Allied government to deplore what happened and warned they might need to fight at some future date. Scobie had no such problems, he ordered RAF rocket attacks on ELAS positions. The fourth division were moved from Italy to Greece. War broke out in and around Athens with the ELAS attacking British tanks with tramcars of explosives and on the 18th capturing an RAF base with 250 prisoners. Scobie went on the offensive and drove the ELAS back and on the 24th Churchill arrived in Athens. He pointed out that the British troops were there with the agreement of Roosevelt and Stalin by which Britain would have control of Greece, Yugoslavia would be split and Stalin would have majority control of Bulgaria, Hungary and Romania. On 11th Jan. a cease fire was agreed, the ELAS agreed to withdraw 100 miles from Athens, evacuate Salonkia and other islands, and a general exchange of prisoners was arranged. In later years the head of the CP was to claim that the whole revolt had been the work of agent provocateurs. As the peace talks continued British forces occupied more and more of Greece. The ELAS started to fragment in particular over the execution of 114 trade union officials. Many surrendered and others were arrested and charged with common law crimes like the murder of German soldiers. By July of 1945 20,000 had been arrested and 500 executed. This compares to 2313 anti-fascists executed by the Nazi’s and 20 executed by the government for collaboration with the Nazi’s. One interesting thing is US opposition to this process which went as far as not allowing American transports to carry supplies to the British in Greece. This was systematic of the post war years as America took control of most of the former Empire or refused to help Britain maintain it. In 1945 Moscow recognised first the Albanian regime and then the Greek one, both serious embarrassments for the party. The general election of 1946 was a farce with reconstituted fascist gangs terrorising the countryside, even the premier asked the British to delay the election, this was refused, the left boycotted and the right was elected. In December of 1945 a republican army (DSE) had been founded based out of Yugoslavia, by 1947 this held 100 villages. In March of 1945 US congress allowed 300 million in aid, 50% of which was military. The DSE ranks swelled to 23,000 as people fled the terror in the towns but they were becoming increasing isolated from the working class, seeing the campaign purely in terms of getting a large enough town to call a capital so Moscow would recognise them. US aid continued to flood into the government. Opposition papers were closed on US insistence and the right to strike abolished. In November 1947 a joint US-Greek army staff was established. Britain donated 50 spitfires equipped with the new Napalm bombs. The DSE was growing still, it was now much bigger than the anti-Nazi partisan forces had been but it was reliant on bases in Yugoslavia. Stalin however was clear «the uprising in Greece must be stopped, and a quickly as possible». The US for the first time found itself in its post war dilemma, how to appear as the force for democracy while backing corrupt regimes. On June 28th 1948 Yugoslavia was expelled from the conform. The Greek CP backed Stalin which was a disaster as they were reliant on Yugoslav bases and supplies. Many KKE members left refusing to follow the Kremlin line on Tito. Part of the anti-tetoism was reorganising the partisan forces as a regular army which was of course a military disaster, serving to give the Greek air force a clear target. By late summer 1949 they had been driven out of Greece and into Albania and in 16th October the Civil war ended. The pamphlet goes on to discuss the years that followed up to the 1967 coup but I’m leaving the history here. This story of Greece has two useful lessons, the first is the oft repeated one of the complete failure of Stalinism and yet another betrayal of a revolution by Communist parties. The second is more useful and relates quite nicely to all the D-Day euphoria going on recently. We are told the allies fought W.W.II to save democracy among other things. Yet Greece provides a clear example of where they instituted a regime probably as brutal as that of the Nazi’s to protect their interests. The refusal of the US to supply British troops, followed by their taking over the area in the post-war period demonstrated that whatever they claimed all the allied forces were fighting not to protect democracy or defeat fascism but to gain a larger slice of world influence.